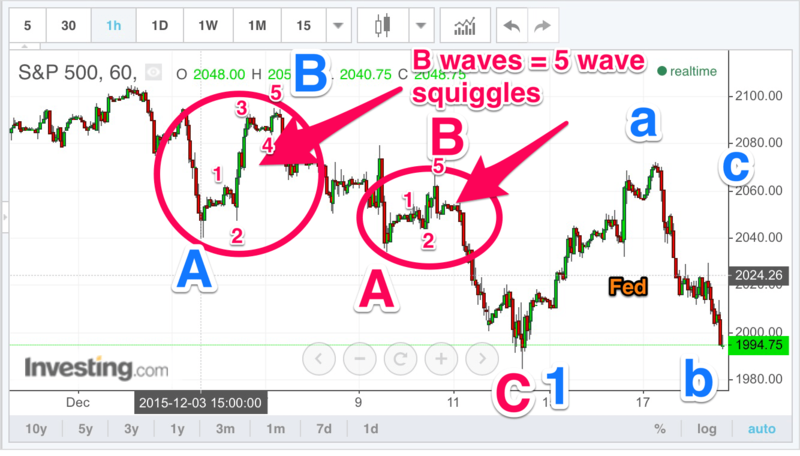 B-waves happen after a A-wave down, which usually appears in some kind of impulsive 1-2-3-4-5 manner to the downside. Then the B-wave happens going up. Here are some potential ways in which the B-wave can move up — often retracing the vast majority of the A-wave down. Typically, on a micro time scale, you will see 5 squiggles. And yes, wave 4 can overlap wave 1 territory (which usually cannot happen in impulsive motive waves). Here’s an example of a b-wave that went straight up. The middle b-wave region was consolidation that went up and down and the Fed announcement was the c-wave down of that b-wave — then it begin the c-wave up before turning back down the day after. Sometimes b-waves just appear as straight up green candles without any opportunity for a retrace whatsoever. Intermediary b-waves appear within a-b-c 3 wave structure. Typically the b-wave portion is the smallest — but even when it is, you may be able to see 5 squiggle– and yes those squiggles can overlap in terms of wave 4 entering wave 1 territory. Even right before the Fed announcement in the above chart between the blue 1 and blue a– there is an intermediate b-wave flat. The b-wave within that is a 5 wave squiggle. The blue b-wave post Fed announcement that went towards 1994.75 was swift –but it kind of ends abruptly at Friday 5:15pm followed by a pop up on Sunday evening. When swift b-wave end with an a-b-c for that c-wave or 5th-wave— then we know this drop was a b-wave and not a c-wave. It was a 3-wave b wave down, rather than an expected 5 wave c wave down. What follows next will be a 5 wave c wave up– potentially completing a 3-3-5 a-b-c flat wave 2 structure– setting up wave 3 down. 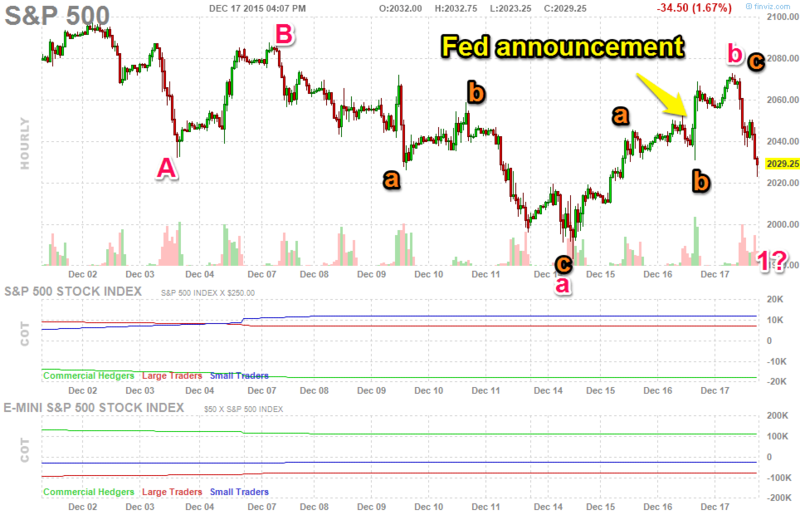 Elliott Wave (A-Wave Down) Elliott Wave (Retest of 4th Wave Support) Elliott Wave (4th Wave Extensions) Fed Announcement, Wednesday, December 16, 2015 – Which Count?